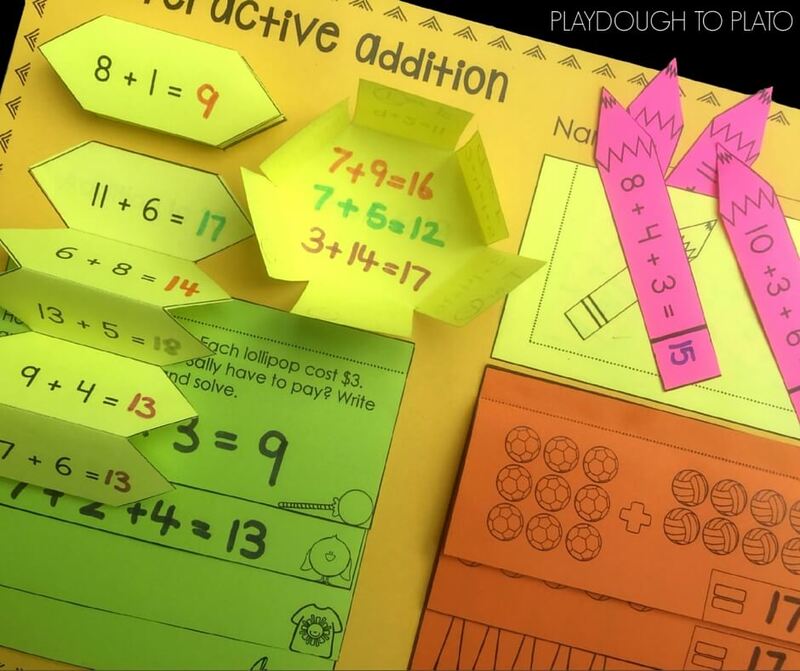 If your kids are working on subtraction within 20 this interactive notebook will help keep them engaged! It includes equations, word problems, picture problems and true/false questions to encourage different ways of thinking about numbers and problem solving. First grade is the focus level for this printable but kinders can also complete it with support. 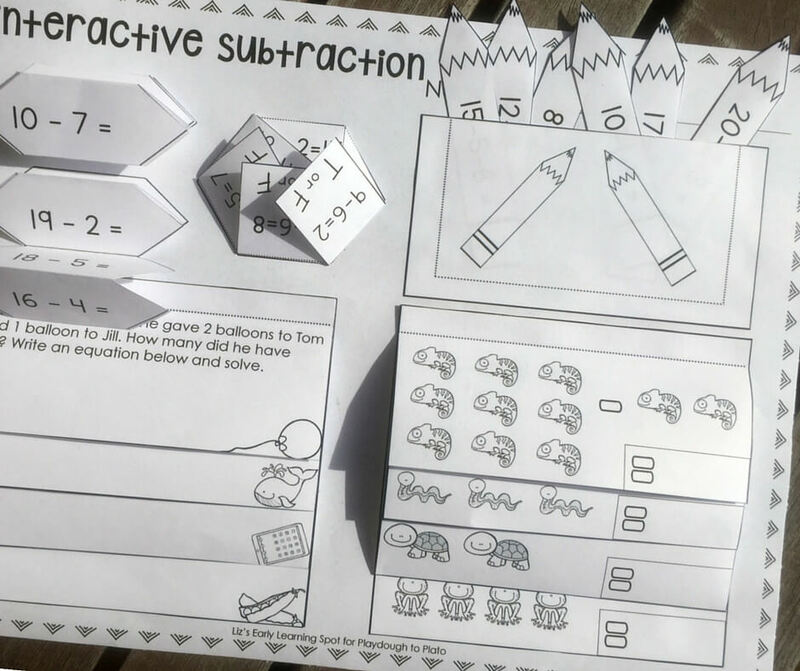 Print off the interactive subtraction printable using plain white or colored copy paper. The interactive page can be created (as in the picture above), or children can be given one activity at a time to complete before putting it all together. It’s important not to overwhelm a child with too many tasks so it’s perfectly fine to complete this activity over a period of a few days. Complete the next concertina strip as above! Attach the strip where it says ‘subtraction within 10’. Cut out around all outside edges, then fold on the dotted lines. Add glue to the center shape and attach to the interactive sheet where it says ‘true or false.’ Fold the ‘petals’ closed. Look at each equation and decide whether it’s true or false. Circle T for true and F for false. Open the petals and rewrite the false equations correctly in the center shape. Cut out around the rectangle with the 2 pencils on it. Flip it over and add glue to the 3 edges that are indicated by the dotted lines. 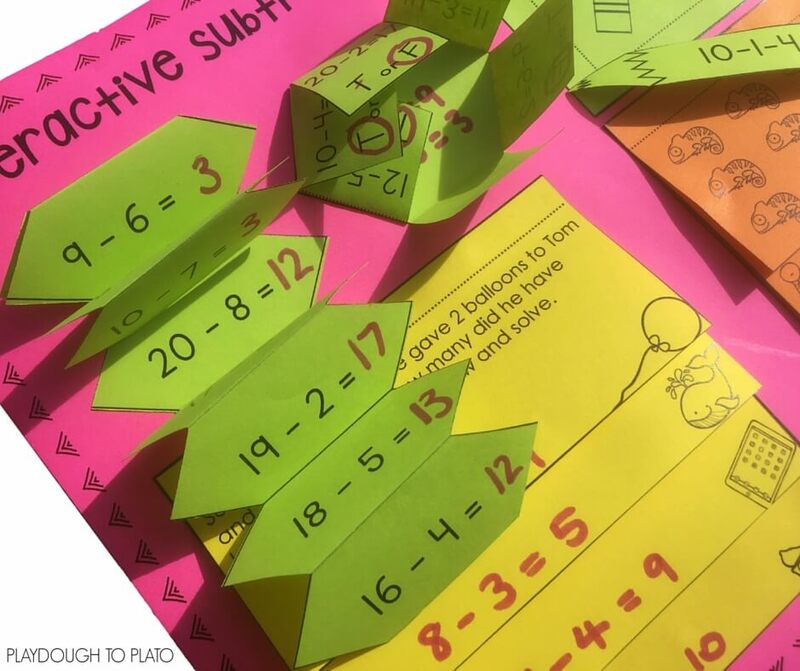 Attach it to the interactive sheet where it says ‘subtracting 2 numbers’ to form a pocket. Cut out the 6 pencils. Complete the equations and store them in the pocket. 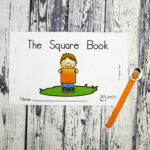 Cut out the larger solid lines of page 5 to create 4 different sized rectangles. 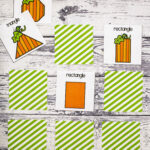 Glue the largest rectangle to the interactive sheet where it says ‘picture subtraction.’ Fold the other 3 rectangles on the dotted lines, add glue on the back just at the top and attach them on top of the page you’ve already glued with the smallest size on top. Complete the equations. Complete them the same way you’ve done the picture subtraction activity. 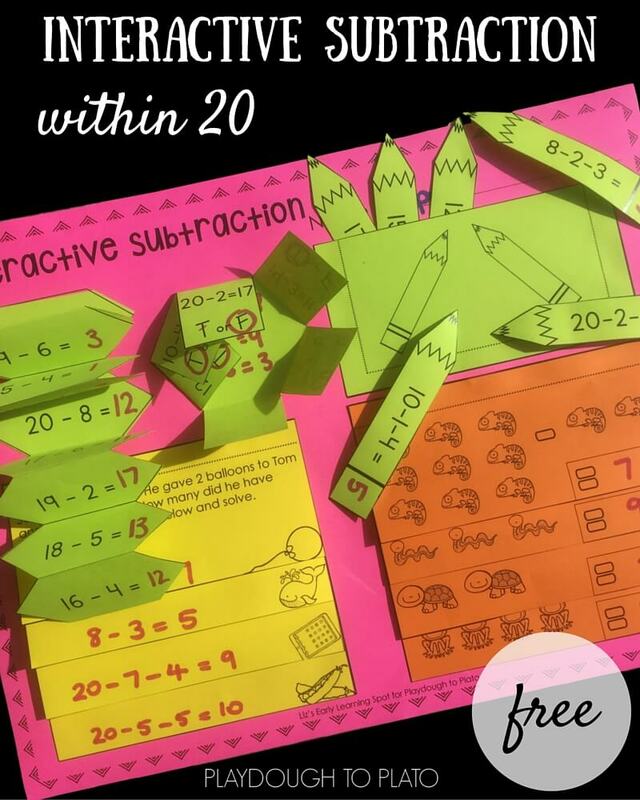 Download the Subtraction within 20 Interactive Notebook by clicking the blue button below and then hop over and grab our Addition to 20 Interactive Notebook too!